Our No-Fuss Pie filling is a berry-lover's delight. Just pour into a pie shell, bake and top with whipped cream. Yum! Yum! Make one individual sized pie. Great for that special holiday treat! Also available in a 42oz size! Sure to become a family favorite! 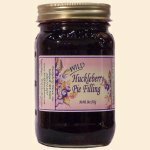 Great for scones, crepes & cobblers too! Ingredients: Wild Huckleberries, Sugar, Tapioca, Citric Acid, Pectin.